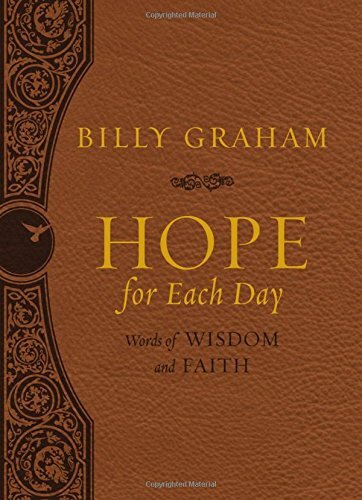 Filled with 365 daily devotionals, Hope For Each Day gifts pages of scripture, thoughts, stories, and words of wisdom from preacher, evangelist and author, Billy Graham. Updated from an earlier edition to include an imitation leather cover, a larger, softer size, a more deluxe interior design, a ribbon marker and of course, lots of grace, peace and faith from a devotional leader. Sturdy, readable and genuine, this devotional will leave a legacy. Respected and honored, Billy Graham has ministered to many all over the world. Complied into a beautiful devotional with an updated and more elegant style, I so admired this devotional. Definitely a book I will use this year and many years to follow, I would be proud to give this one as a gift, present it to a church, or recommend it to a friend. Though not too deep, each devotional contains enough of a message surrounding hope and inspiration that I can delve deeper on my own or keep the smile within my heart for the day. Beautiful!